My most recent experience was six months ago after dental surgery. The dentist prescribed a seven-day course of antibiotics after pulling my wisdom teeth. I did not think twice. I followed his instructions because I wanted to avoid tooth infection. However, the treatment did not come without its side effects – I noticed that I had sluggish bowel movements after taking them. Since I have seen the records of patients who reported loose stools and diarrhea after taking antibiotics, I at first thought it must have been from something else. But it wasn’t. Constipation is the most frequent digestive complaint in the United States. It is a condition in which you typically have difficulty releasing solid waste from your body. Stools are generally infrequent – less than three each week – or hard, dry and small, making them very painful and difficult to pass. Constipation can be very damaging to your health because it limits your body’s ability to get rid of toxins which may result in the weakening of your immune system. Some consequences of constipation may include development of chronic and degenerative illness such as cancer, autoimmune disorders, accelerated aging, cataracts, rheumatoid arthritis, cardiovascular and many other diseases. We have a large community of all sorts of bacteria living in our gut that helps our bodies digest food as well as eliminate waste. Antibiotics can kill many of these beneficial bacteria while it is attacking the infection-causing bacteria. Consider the loss of good bacteria as “collateral damage” in your war on disease. The result of losing these “good” bacteria may cause an imbalance in your gut flora which, unfortunately, leads to a variety of intestinal distress, which may include constipation. 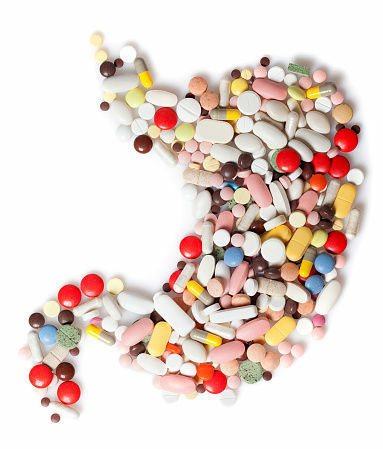 Studies show antibiotics may negatively affect upwards of 30% of the good bacteria in our guts. Eat foods rich in “good bacteria.” These foods include many yogurts, pickles, sauerkraut, kefir and kombucha. You also may consider taking a good probiotic supplement, but just make sure it has been clinically proven to survive the journey to your intestines. Talk with a qualified physician about increasing your intake of these foods or supplements either when you start or just after your finish your antibiotic therapy. A very recent study found evidence that hospitals using probiotics closer to the first dose of an antibiotic regimen reduced the negative impact of antibiotics. You can boost your magnesium levels through the foods you most likely eat every day. For magnesium, nothing beats green vegetables such as spinach and chard or almonds and black beans. I am a firm believer in knowing what is going on in my body before I embark on any kind of preventative or curative program, whether it be exercise, supplements or diet. I would ask that you do the same. So, if you’re taking antibiotics and you start having constipation, first check to see how the antibiotics may be impacting your gut flora or nutrient levels before you start taking probiotics or changing your diet. There are simple laboratory tests you can take that will tell you what is going on with the population of gut flora or your nutrient levels. Then you can work with a qualified physician to make the most appropriate decisions.